While Natural Ventilation is always our first choice it doesn't work in all facilities. In some spaces, like small enclosed rooms or rooms with low ceilings, a Powered Ventilation System is the best solution. 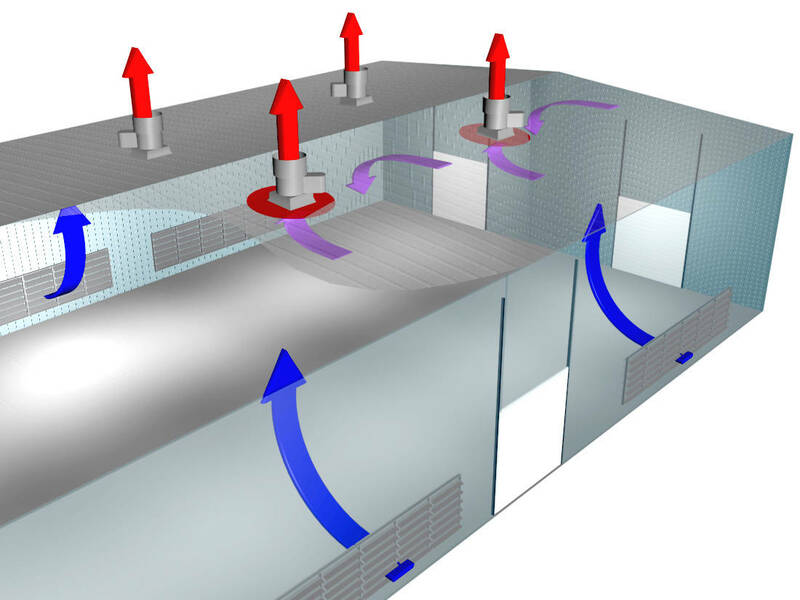 A powered system uses exhaust fans on the roof to pull the hot, dirty air out of the room with a greater force. This works especially well in situations where the intake side of the fan can be placed near the heat source, like work rooms and kitchens. Finding the right powered roof ventilation system can be tricky. That’s where we come in. Moffitt has been designing, manufacturing, and installing roof vents and roof fans for over 55 years. We can help you find the best roof ventilator for your facility. Moffitt will determine the number of fans you need for your facility, and after analyzing the design of your building, we’ll help decide where they belong for maximum ventilation and peak performance. When a client requires numerous types of fans, or a large quantity of fans, having the systems laid out beforehand makes increases functioning. Aside from manufacturing powered ventilation systems, we also design and install them. We are a one-stop-shop for natural and powered ventilation systems, ensuring that your facility has the right ventilation from the start. Utilizing our powered ventilation systems in conjunction with natural ventilation makes for a pressure gravity system. Pressure Stream – Designed for commercial and industrial use. Hooded Roof Fan – Designed for industrial and commercial application in various industries. Upblast Fans – UB3100, UB3300, UB3400, and UB3700 are all best for providing general ventilation to hot, stagnant areas. Tube Axial Fans – TA2300, TA1000, and TA2000 are designed for applications where high volumes of air require lower or higher static pressures. Have questions about which roof ventilator is right for you? Call the Moffitt team today for your Free Ventilation Design. With just a few questions we can provide you with a preliminary ventilation system design and advise you on the best roof ventilator options. Read more about natural ventilation versus powered ventilation in the blog post found here.